SPOILER alert! I got my box on Saturday and wanted to post then. I just lost track of time. I would give this box a 3 out of 5 stars. Even though its not my favorite box, I'm still ADDICTED to the cute, cuddly and sweet boxes! Join in! Amazon's price is $2.94 per ounce. Behind is a Petite Lemon Alphabet Print. I'm pretty much the most disappointed in this part of the box. I know Petite Lemon is a super cute place to get nice kiddo poster, growth charts and what not, I just don't really need it in my box. Its a small 8/12X11 or 8X10 piece of thick stock with the alphabet on it. Not my favorite, and took up a lot of "cost" of the box this time. Rich Frog Knit Block (with Lion!) Cute, soft and cuddly. I like it, but I just hope the dog doesn't get a hold of it! + Petite Lemon's $24.95 poster. I give the box a 3 out of 5 also because I could have spent the $20 in a different way on products I CURRENTLY need. 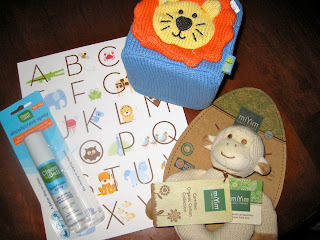 These are cute and fun (and new) products, I just would not have picked them this time. Citrus Lane is a monthly subscription box that sends you a box based on your child's gender and age! Its fun to see what other age groups get, but usually there is a theme! The subscription is $25 per month and you can subscribe through this link. If you use code SPRINGFUN on a 3 month or more subscription, you get 10% off! Let me know what is your favorite! What an awesome box! I would love to get my sister a subscription to this for Christmas! Thanks for the idea! I love Citrus Lane. They have the cutest things in their monthly boxes! What an awesome box and it sounds adorable! I received the same box and was so disappointed with the "poster"... What am I supposed to do with it considering my box was to my 1 month old daughter?